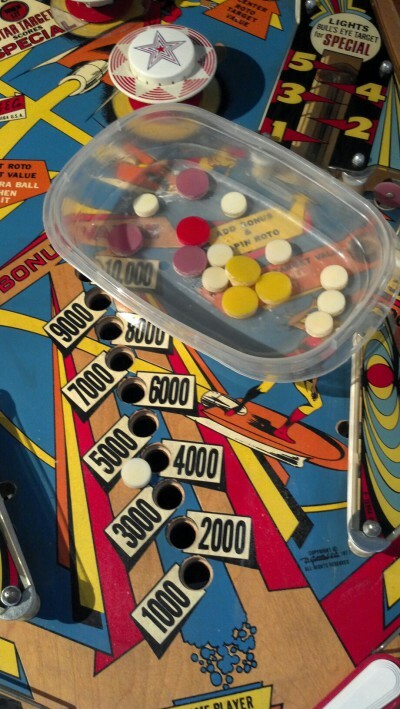 This entry was posted in Electro-Mechanical, How-To, Maintenance and tagged em, gottlieb, inserts, jet spin, playfield, super spin by admin. Bookmark the permalink. Nice set of videos! I’m just about to start a restoration of a Gottlieb Bronco, which is of the same vintage as your Jetspin. I notice in the videos that the bottom corners of the two lower plastics are broken off, just like on my Bronco. I guess you decided not to repair these, and just put washers there instead? Great Videos.. Thank you. One piece you skipped on your machine was leveling the inserts with lettering. After watching your videos, I can handle the solid inserts, but I have a few with lettering I want to preserve, and I can’t leave them like you did in the video. What type of clearcoat should I use? You mentioned automotive clearcoat and I’ve seen different discussions on clearcoating playfields, but I don’t want to buy a lot of clear to do a few inserts. Like you did with the game in your video, I’m trying to make my game playable, not restored. I wish I had more experience with clearcoating, but at this point I don’t. I will have to reserve any recommendations until I can offer more wisdom on that.